Our giant Nordic tipis provide a magical alternative to traditional marquees, for year-round weddings and events. 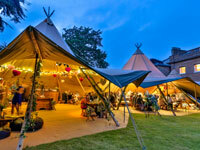 Any number of tipis can be joined together to accommodate up to 1000 seated guests. A full range of carefully chosen furnishings, lighting and other lovely things can be supplied to help create a really special and unique venue! Having a party or a wedding? 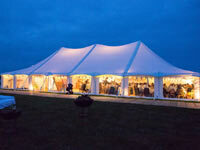 Looking for a traditional marquee hire company? You’ll love the traditional style canvas tents available from Blue Fizz Events, and being experts at party and wedding planning, we can offer a whole lot more too, if you so wish. The canvas marquees are quintessentially English and perfect to hire for parties, company events and weddings. You don’t need to worry about the setting either, as we can source the most breathtaking and unique sites in Devon. Made from natural cream, waxed canvas with feature wooden poles and hemp guy ropes, they’re stylish inside and out, and suited to any weather. We can offer beautiful accessory hire and a bespoke Wedding Planning and Styling service to complement. Whether your vibe is Boho, Festival or Country Garden, Let us create something special for you! 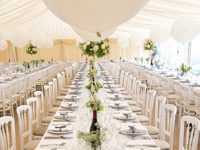 Hatch Marquee Hire is a leading supplier of frame marquees with experience in creating elegant wedding marquees, tailor-made for your special day. With a broad range of equipment including our stunning clear roof marquees, rounded ends and a selection of stylish furnishings you can be sure that we will provide you with a quality marquee. We take great pride in the work that we do, whether you are organising a small cosy celebration or a large wedding reception. We offer a professional , friendly service which allows you to be part of all the big decisions and leaves us to make it happen! 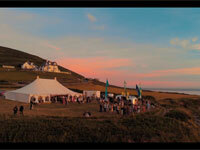 Absolute Canvas marquees Cornwall are a marquee hire company with over thirty years of experience. At Absolute Canvas they can offer a range of beautiful marquees; from elegant traditional, to stunning clear span marquees. Each marquee is a blank canvas and can be styled to your individual taste; from rustic English fete style, to your lavish modern finish. They can supply different linings; flat or pleated, with coloured ceiling over lays and swags, to compliment your chosen scheme. The options are endless! 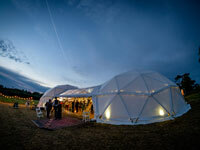 We are suppliers of beautiful timber-framed domes that are handmade and designed by us. Not only are the domes visually stunning courtesy of their intrinsic framework - the natural light pouring through the expansive clear sections and lending themselves to any style, they also tick all the boxes with every practical use of space. We offer three unique configurations, our Single Dome, Single Dome and Sail, and the Double Dome, all complemented with the perfect rustic furniture, Victorian floorboard tables and rustic benches, and ambient lighting to create that magic atmosphere. 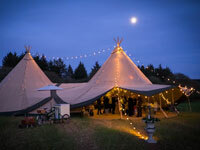 Providing Giant hat Tipi’s for weddings and events Wild Tipi have their hearts and feet firmly in the ground. Inspired by a love of nature they create beautiful individual spaces from small and intimate weddings to large 500+ parties. Basic hire and bespoke wedding packages available across Cornwall, Devon and beyond. 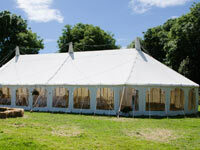 Coast2Coast Marquees provide both frame and traditional styled marquees. We can provide levelled wooden floors, linings, lighting, furniture, dance floors and all your power requirements. We are wedding specialists and ensure our equipment is always in pristine condition for your special day. 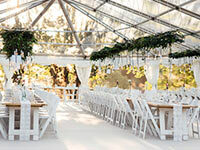 Visit our website to see a virtual tour of our marquees. We are a family run business based in Helston giving over 30 years of experience. Whether you are looking for marquee hire for a wedding, corporate event or simply looking for catering equipment hire, we can help. Unlike most other marquee hire companies, we also provide all the event hire extras you need to make the day complete: crockery, cutlery, glasses, linen.... Quite simply, everything you need. Visit our web site for more information.